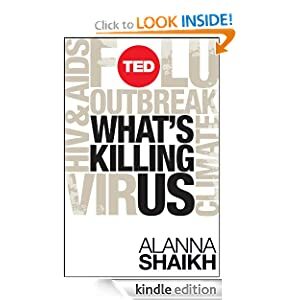 An instructive e-book on global health by TED Senior Fellow and healthcare expert Alanna Shaikh debuted a few weeks ago. What's Killing Us: A Practical Guide to Understanding Our Biggest Global Health Problems discusses a series of global health challenges, why they matter to the rest of the world, and what can be done to minimize or negate their impact. The short e-book is a quick read, an hour or so, and is intended for an audience that is interested in but not knowledgeable about global health. For someone who reads and writes about global health on a daily basis, this is an excellent resource. I can see this as a text used in an undergraduate course on development or health. Alanna makes it an engaging read by using a semi-informal style that does not minimize the gravity of the content, but invites the reader to engage in the information in a manner that is beyond pure consumption. For global health professionals, this is the book you want to give to your family and friends so they can understand why you do what you do. Alanna graciously agreed to answer some questions about the book. Tom Murphy: Given the general TED audience, why did you decide to write an e-book that is intended for people who know little about global health? Alanna Shaikh: One thing I know from attending TED is that global health is surprisingly opaque to most people. Everyone had heard a little about HIV or a little about bird flu, but it's rare to find someone without a global health education that has a background in the issues. Media coverage of global health isn't great, so no one really has a base level of knowledge unless they seek it out. People have been asking me for years how they can get started learning about global health, and I never had a suggestion. So I wrote a book I can suggest. TM: What do you think are the 3 greatest challenges to improving global health? AS: There are so many challenges. If I have to bring it down to 3, I'd say 1) Funding. Improving global health takes money. 2) Human resource capacity. We're short on health professionals almost everywhere, from clinicians to administrators. And the people we do have need training and support. 3) Human behavior. A lot of global health is about convincing people to make decisions to support their health, and it's very difficult to get people to do that. TM: In a tight fiscal time, it is becoming popular to slash aid funding. Why should an American care about eradicating polio in India or stopping the spread of malaria in Tanzania? AS: Because if we don't stop these things at their source, they will come to us. Borders don't stop infectious diseases. Now that we have cheap air travel, even oceans don't. It is cheaper and more effective to put a stop to diseases before they travel. TM: A health professional has been tipped to be the next World Bank president. If you had an opportunity to advise him on global health programming and funding, what areas would you encourage him to support? AS: Strengthening health systems. The World Bank is well positioned to support countries in building their basic capacity to provide health care - everything from infrastructure improvements to provider training to supporting drug supply chains and procurement of essential drugs . TM: If you could have added one more topic area to the e-book what would it have been? Why did you decide to keep it out? AS: Cancer. Or maybe traffic accidents. Or nutrition. There were a lot of things I would have loved to cover, but TEDbooks have a word limit! TM: The reader can be a bit depressed after reading the e-book. How about we end with something uplifting? What it happening right now that make your optimistic about the future of global health? AS: Many global health problems have clear solutions. All we need is money. That's not true for most development challenges, but it's true in global health surprisingly often. Thanks to Alanna for taking part in the interview. You can buy her book here. It is only $2.99!